My life in seven years. #14. Your life in 7 years. What’s that you ask? My life in seven years? Hmm. What will my life look like or what will have transpired between 2015 and 2022? The first thing that comes to mind. Will I still be walking Earth when I turn seventy-two? What’s that you say? I have a fifty-fifty chance? Hmm. My mother passed at age 63 of causes unknown but suspected relating to high blood pressure and hypertension. She died sometime in the night and from the drugs found on the kitchen counter, the coroner suspects she may have had some pain that sent her in search of her meds. A heart attack, maybe. No autopsy, so we’ll never know. The last year of her life wasn’t so great, being married to an alcoholic who broke her arm the day before Thanksgiving. Still, she loved him in that way women do when they settle. I suppose she was as happy in her relationship as she allowed herself to be. I suppose she was content to spend hours on the sofa crocheting while she watched TV. My father died at age 78 from complications related to kidney failure. The last week of his life was filled with excruciating pain and I remember him popping pain killers like M & Ms. They didn’t help and there’s no doubt that his passing gave him nothing but relief. Which brings me back to the question and me sitting here talking with you. Where will I be, what will I be doing the next seven years? Turning sixty-five was no big deal for me emotionally. In my head I’m still forty. But in the United States sixty-five means Medicare and at my age that’s a milestone because, unlike some of my friends who have aged well, I have struggled with an autoimmune disease and Ménière’s for more than twenty years. I know the meaning of a good day; I don’t have them often. With any chronic illness there are days when you would just rather stay in bed buried deep under the blankets because sleep provides the only comfort, until it doesn’t. What’s that you ask? What’s all this mopey talk about death, pain, and dying? Let me explain. Time has always been a huge issue with me. Never enough time to read, to work on projects, to take that special vacation, to enjoy my surroundings. Three years ago one of my writing buddies succumbed to cancer. She was writing her memoir and excited about sharing it with the world. By exploring her past she was changing. Acknowledging the wrongs she endured opened her up. She was happier, more friendly, more excited about facing tomorrow. When she passed, still hoping to finish that memoir that explained what it felt like to be the younger sister to a mentally ‘retarded’ brother—her word, not mine—it broke my heart, and I will always remember her as someone who left this earth too soon with work undone. But I suppose that applies to most of us. What’s that you say? I’m rambling and avoiding the question? Hmm. Perhaps, but I don’t think so. A college professor once posed the question, “Would you like to know when you are going to die?” I was taking a literature in the Bible class. He was staunch Catholic. A few students said, yes, they wanted to know so they could prepare. Others like me had no desire to know. Here’s the thing. I just made a major life-changing move. Nothing about it was easy even though in my heart I had already left my current home with visions of how wonderful my new home and surroundings would be. Major life-altering realities tornadoed around me, not the least of which were leaving behind specialists who had cared for my husband and me most of our adult lives. But life is fluid. It ebbs and flows, and when it doesn’t you begin to die. Like my mother. Like my father. Like my writing buddy who was just learning to love herself. Life is not stagnate. You keep moving or you start to decay. So, you say. Get to the point. My life in seven years. Yes, I can give you a bucket list. See New York, Times Square, and the Statue of Liberty. Take a European vacation with my husband, my son and his wife. I know how to make lists. I used to do it all the time. In five years I want to be retired. In ten years I want to visit Spain. But I don’t really expect my life to look like that. With any luck it will look like my life today. Ticking away too fast. Reminding me to declutter. Reminding me to let go of things that don’t really matter. Pushing me to follow a new path and challenging me to enjoy the journey. But here’s the truth. At this moment, with my dogs cuddled at my side and a pen in my hand, I can think of nothing else I need or want. I can think of nowhere else I’d rather be, not even seven years from now. 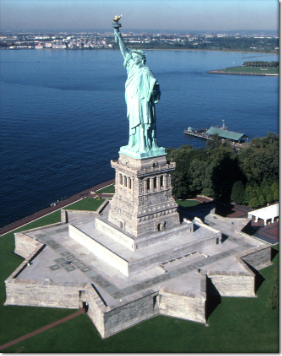 This entry was posted in Bonnie's Blog, year 2015 archives and tagged death, life, Spain, Statue of Liberty.